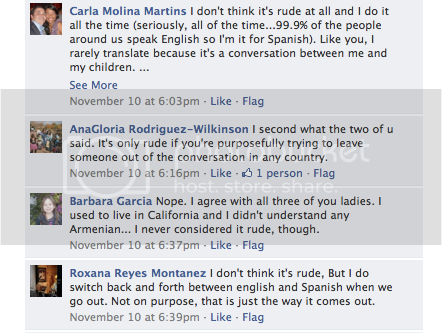 Do you think it’s rude to speak the minority language with your children when you’re around people who don’t speak it? What do you do? I kind of new what to expect, but I was still curious to get a feel for how you deal with this situation which doesn’t seem like a big deal when you have babies and toddlers who can barely speak, but can become an issue the older and more talkative they get. It’s happened to me with my 4-year-old daughter, Vanessa, who started talking pretty early and hasn’t stopped since . 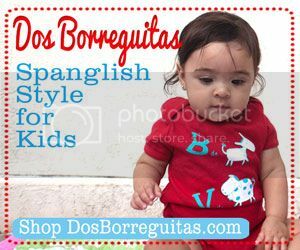 As many of you know, we use the mL@H method – meaning we only speak Spanish to them – to raise our children bilingual. So, in our case, speaking to them in any language other than Spanish seems unnatural. * Therefore, when we’re around people who don’t speak Spanish, we generally just continue speaking in Spanish – unless what I’m saying needs to be understood by all and then I’ll just say it in English. While I’ve never been told that it’s rude, I could see where some monolingual people might feel that way. I guess it’s awkward not to understand what someone next to you is saying because there’s always a slight chance that they’re talking about you. Some of you felt this way and told us that for this reason, you end up translating what you say. The way I see it is that most of the conversations I have with my children are really intended to be between them and I, so why would it matter if others understand, right? Having said that, the bottom line for us is that we simply don’t use English to communicate with them, save the odd word or phrase here and there. Honestly, we don’t do it because we’re trying to be so strict about our efforts to raise them bilingual, rather because Spanish is our first language and, again, it’s what comes natural. And so, I decided to continue the discussion by finding out if this makes a difference or not by asking whether you speak to your children exclusively in Spanish. The answers proved that the method you use to raise them bilingual has a lot to do with how you deal with my original question. Interesting, right? So, if you didn’t get into the original discussion over in our Facebook page, what do you think about this topic? How do you deal with it and what method are you using? Let’s continue the conversation! * I should clarify that I have started speaking French with Vanessa, in an effort to expose her to a third language as early as possible, but our interactions obviously limited because of her lack of vocabulary. Furthermore, it has been a conscious decision on my part to go ahead and introduce French, while English has always been something that Vanessa has heard outside the home and mostly when we’re not around. I really have found that most people around me get it when they hear us speaking in Spanish. I always explain that I am raising her bilingual and that this is the best way to do it, and it usually sparks the conversation. Like Ana, I also find that people really don’t mind that I speak to my kids in Spanish in front of them. In fact, I have really been amazed that they don’t, especially since I live in an area that hardly (well, more like just me and a handful of people in the whole city and its vicinities) speak any Spanish. On the contrary I usually get positive comments about raising them bilingual. That’s interesting, Lisa, because I’ve been actually reading about how the answer to my original question has a lot to do with how the community you live in feels in general about foreign languages. 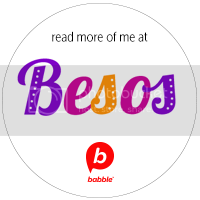 If there’s some kind of negative view – as there unfortunately is about Spanish in many areas – about the minority language, it gets a bit harder for those of us raising bilingual children to use it with them while we’re in public. I would not say that a person should never speak Spanish in front of non-speakers, but I think it’s a little overly simplistic to say that it’s only rude if you’re trying to exclude someone. A non-speaker who can’t understand anything that is being said has no idea if he/she is being spoken about, or left out on purpose. I work in a situation in which everyone is bilingual, albeit in a huge variety of different languages. It is generally accepted that English should be used, since it’s the one we all have in common. I also think that the circumstances can make a big difference. A quiet conversation in Spanish by two or three people sitting next to each other is very different from a conversation across a crowded room of non-speakers. Also at my job most of us speak various different languages and we stick with English, but it is different when you are a parent and the child is swamped with English everywhere they go, the parents are the ones that keep the minority language going. I agree that things are different in a conversation between adults, but I have a hard time with the idea that I have to use any language other than my own when I’m speaking to my children regardless of whether there are non-speakers around us who have no idea what is being said because, at the end of the day, it’s truly between my children and I.
I usually only speak spanish but I do translate sometimes. It’s that voice in the back of my mind that speaks for the other person in the room, it tells me not to be rude, and I’m really not talking to that other person but I can’t help it, the translation just comes out! Although since my in-laws don’t speak Spanish at all I think they have learned little by little just by being present and watching us speak Spanish. I will continue to try and do just Spanish! I’m also guilty of translating. I think it makes for a nice compromise. Like BethO says, it’s easy now because conversations are simple, probably won’t be able to do it once she’s older. I rarely translate, but not because I don’t care about the people around me, it just doesn’t come out like that. Whenever I do, I feel so strange because, again, we don’t speak English to our children so switching to English seems completely unnatural and forced. This is exactly what kept me from speaking exclusively in Spanish to my son for the first 2 years of his life. It is so natural now that I don’t even think about what other people think. It doesn’t even occur to me before I speak. I have noted people’s sentiments, reactions and behaviors in the peripheral, as well as directly asking a few people. 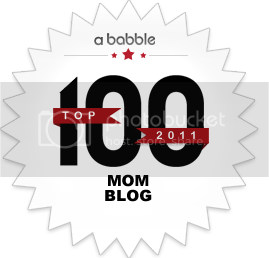 I am pleasantly relieved that most people think it is honorable (and I am kicking myself for waiting so long with my son to speak Spanish in public). Now all the high schoolers who are learning Spanish and the adults who still remember a few basics LOVE practicing with my kids! (It’s a lot less intimidating to chat with a 3 year old, than with your professor or a fluent quick-speaking native speaker). I catch others watching and marveling. Those who I have asked specifically have said it inspires them and they begin making it a habit to use the words they know of another langauge even if it is just a few (such as my friend whose family is Croatian). There are a few people who make comments about not being able to understand. If we are in close conversation I will let them know the jist of what I said as a side to them, not to my kids. Internally I sigh and roll my eyes–as if they can’t understand from context what I am talking about to a 2 year old! Very interesting observations, Melissa. Thanks for sharing with all of us. Just wondering though, when you say this is what kept you from what kept you from speaking in Spanish exclusively at the beginning, does that mean that people would actually say you were being rude or you just worried about what people would say or whether you’d create a kind of uncomfortable situation for all? I find it amazing that others are inspired by what you’re doing. Hopefully more and more people feel the same way and soon enough being bilingual will be the norm in this country! I speak to my children in Spanish “anywhere” we go. And I never, ever apologize or translate if someone is around (e.g., in an elevator). 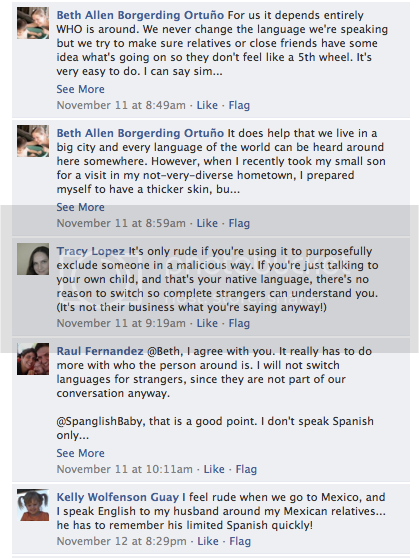 However, if we are in a group conversation, I try to be sensitive to the person who doesn’t speak Spanish. Overall, I have no problems speaking in Spanish in public — in fact, I’ve noticed I tend to do it more. I do it to role-model for children…I don’t want them to grow up feeling embarrassed or afraid to speak their language. I almost never translate, but I now do when we are around other children who do not speak Spanish. I was horrified to hear my four year old nephew tell my three year old son, “Why do you speak Spanish. 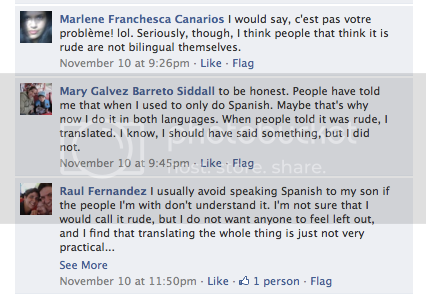 I don’t like Spanish.” I now translate so not to leave the other cousins out, and I have tried to make Spanish fun. The cousins now all go to a parent and me Spanish class that is a lot of fun, and that they all enjoy it. We also watch bilingual shows like HBO’s Perro y Gato. I have really worked to make Spanish fun for all the kids, and I think it is working. The kids are now starting to ask me how to say things in Spanish. If I translate, I don’t leave the other kids out, and they may actually learn along with my children. When I am around non-spanish speaking people most of them seem to understand that I am talking to my son and don’t mind, but there are a few times when some people will be rude and make gibberish noises or ask me to speak english. When those few and far between times happen I polietly ask them if they could be more culture sensitive and respect that I am trying to raise a bilingual child. They usually don’t reply. In general it is my opinion that speaking a different language infront of others is no way rude, it is intellegent. way of living preferences, gender, religion and age ethnicity etcetera. page from your details web page as the details and facts box will soon be gone. some page analytics. Buying a facebook ad could also mean you have used your money to buy facebook fans. stream coverage software from anywhere of the world. views of all mates on the topic of this article, while I am also eager of getting familiarity.